Geo-Solutions successfully completed pond embankment improvements at a plant for a client located in Bartonville, Illinois. 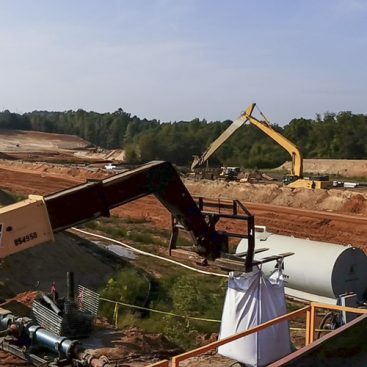 The pond embankments were part of the fly ash management program and were designed to minimize off-site seepage of process water. 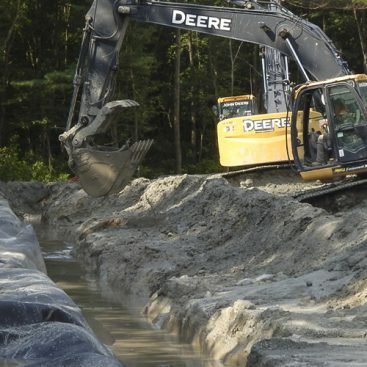 The embankment improvements included installation of a cement-bentonite vertical barrier wall necessary to decrease the permeability of the embankment and minimize seepage through the pond embankments. 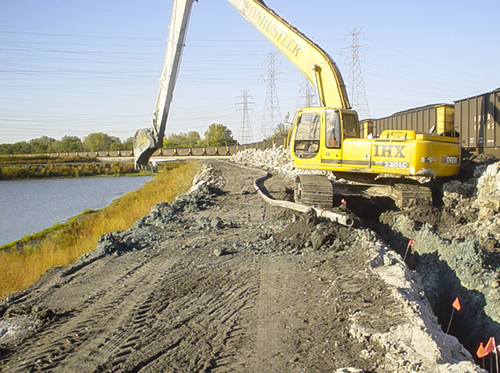 A higher strength backfill material (50+ psi) was required to support truck traffic on haul roads, which followed the embankment through the fly ash management area. Geo-Solutions installed the 700 lf, 21,000 sf vertical barrier wall to depths of 30 feet employing proven slurry trench techniques. 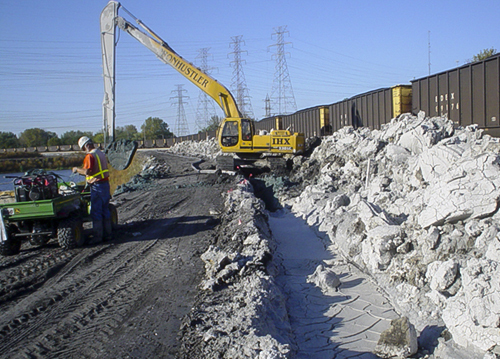 However, in order to meet the strength requirement for the cut-off wall while maintaining a low permeability, Geo-Solutions developed a unique cement-bentonite slurry mix design containing Type S cement, which is a slag cement, and natural bentonite. Slag cement, as the name implies is produced by milling blast furnace slag into a granular form. This material has a long successful track record in Europe in the construction of vertical barriers but it has been only recently that slag-based cements have become readily available in the United States. The primary use of slag cements in the United States is to produce specialty lightweight concrete for the construction industry. An active railway paralleled the length of the barrier wall. Work had to be coordinated daily with rail owner/operator to ensure safety and maintain work-area accessibility. Typical cement-bentonite mixes using Type I or Portland cement would barely meet the permeability requirement and fall significantly short of the short term and long-term strengths. Simply increasing the cement content of the mix to increase strength would result in unacceptable permeability results. 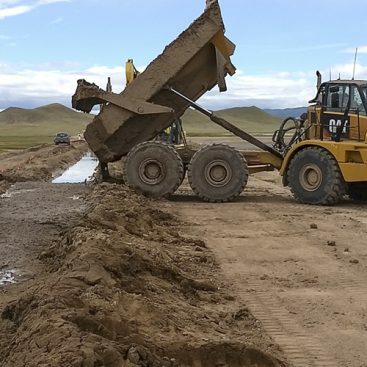 Although the strength gain develops much slower with slag-cement, unlike Portland cement, slag-cement is not affected by the introduction of bentonite into the slurry. 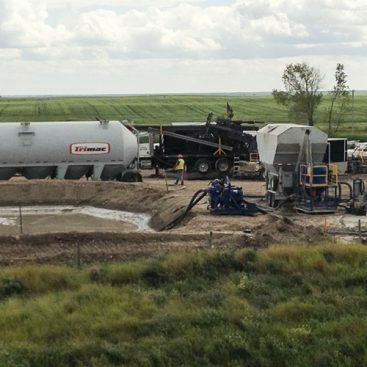 Results of Geo-Solutions’ rigorous quality control and laboratory testing program indicated the slurry backfill material developed the required strength of 50 psi within 28 days of cure and permeability was maintained below an average of 5 x 10-7 cm/sec as required.